Ah, the 30-sider. When I was a teen, I bought my first pair of Armory d30’s along with their book of d30 and d300 tables. I haven’t seen said book in many years, but recently came across a picture of it on Quag Keep and went into flashback mode. I hardly actually used the tables in play at the time (although these days I use random tables extensively), but I certainly recall the book with the rose-coloured glasses of nostalgia. The RPG blogosphere has adopted the d30 also. There are many blogs that post random tables using the d30 under the umbrella of the “order of the d30” and, as referenced in that article, Jeff gave us the Big Purple d30 Rule – a house rule we are using in our most recent Pathfinder campaign (warning: it really falls apart a bit in games that use percentile chances of success, because swapping in the d30 instead of the d100 means that the odds are grossly in the character’s favour – we ended up agreeing to only allow it on d20 rolls). While my own random tables tend to be more d12-centric than d30, I appreciate the nostalgia that the many order of the d30 posters bring with their Armory-inspired random tables. And I really wish I had a copy of the book still. This is post #20 in the A to Z Blogging Challenge – T is for Thirty Sided Dice. If you like it you should also look at the Central Casting items for character generation though they also have one for Dungeons as well. There is also the AEG Toolbox books and for names the JG Treasure of Archaic Names. Didn’t catch you had already linked to it. Heck I didn’t think anyone saw what I did prior to the A2Z stuff. Thanks. I have that book from the old days, but it’s in storage at the moment. When I get a chance to go pick it up, I’ll grab it and post a favorite table or two. I need to make more d30 tables again . I never owned that particular Armory product. I bet it is pretty good, like most Armory stuff. Friend of mine just thrust a copy at me to remind me that it… isn’t. Probably the weakest of the random table products I’ve re-read recently. I’ve never seen it, but could you expand on what makes it weak? And by “random table products” do you mean products you pay for or general d30 tables that people are generating on the blogospherion? I mean books like Toolbox and Ultimate Toolbox from AEG, or Nuisances from Skirmisher Publishing. Or even the random tables throughout the 1e DMG. This book is weak – I was definitely remembering it through the rose-coloured glasses of nostalgia. Got it. Wow. I am intrigued by Door as language, but you don’t need a d30 table for that. 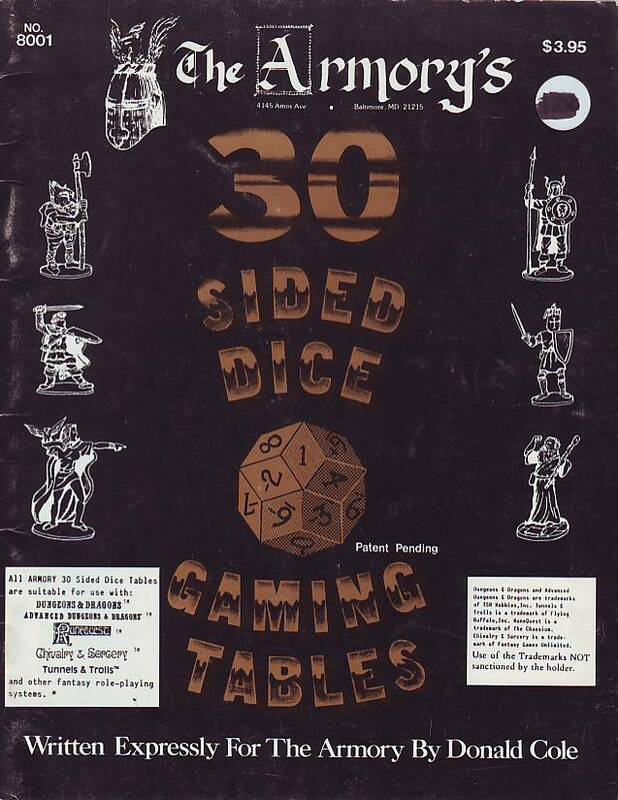 Does anyone have a copy of the original d30 critical hit table that came with the 30-sider? It was a single sheet of paper that came in the ziploc bag with the die?